A good night’s sleep – it’s the perfect gift. There are few things more important than getting enough rest. Going without enough sleep can lead to all sorts of problems, from shifts in metabolism to daytime sleepiness to mood changes. But getting that shut-eye isn’t always easy. If you’re the type that just can’t get comfortable at night, you might want to look into a new pillow. Pillow choices now aren’t limited to stuffing types. There are tons of different kinds, and the choices are designed so that you can pick the right pillow for how you like to sleep. The SideSleeper pillow from Pro Air is, obviously, designed with those who like to sleep on their sides in mind. It has a unique shape that doesn’t look like the average pillow, but serves well to keep your head and neck properly aligned. The SideSleeper resembles a candy cane in shape, with a curve at the top with one long and one short side extending from it. You are meant to sleep with your head on the curve – there’s even an ear-well to ensure proper head placement for optimum sleep posture. The short side extends towards the front, providing ample resting space for your face. The long side extends along your back, providing a little extra support. The pillow itself is quite soft and malleable. It is filled with polystyrene foam beads, which give it plenty of softness. Because it is so oddly shaped, you won’t be able to use your standard pillowcases with it, but it does come with it’s own white case, which is removable for easy cleaning – although it does require hand washing versus a quick toss in the machine for standard cases. It’s quite comfortable to curl up with, although it does take a little getting used to, as it is a departure from the norm in both shape and feel. 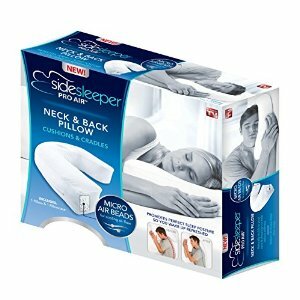 I found the SideSleeper Pro Air Pillow to be a bit of an eye opener when it comes to proper sleep posture. The pillow comes with a short instruction sheet that gives you tips for properly placing your body for best posture, and apparently I’ve been doing it wrong. While I can’t say it changed my habits in one night, it id give me a good idea as to how the proper sleep posture should feel, which will hopefully lead to a better night’s sleep in the long run. If you’re a strict side sleeper, you’ll be pretty happy with this product – it’s soft, comfortable, and the shape feels just right for curling up on your side for a nice nap. However, if you like to switch back and forth between positions, it may not be for you. That same comfy shape for side sleeping isn’t all that comfortable when you’re on your back.